20 Free MultiPurpose WordPress Themes For Websites Of All Niche! How to Choose the Suitable Multipurpose WordPress Theme? While we have mentioned all the benefits of owning a multipurpose theme, there are seemingly hundreds and thousands of choices out there. And the one thing that pops in mind is how do we choose the right one? Here are a few tips that might help out with the process. All-around Features: A multipurpose WordPress theme should have all the basic features of almost any type of websites. The more the better! SEO optimization, contact forms, translation ready, social media integration, etc. are one of the most essential features of any type of website nowadays. So, make sure that the theme features all the necessary options that you might require. 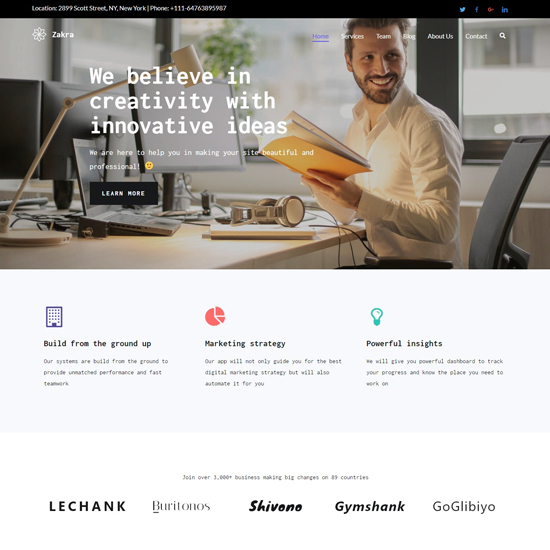 Flexibility: If you want to create many websites with a single multipurpose WordPress theme, you need to make sure that the theme is highly adaptable. It must have a responsive design which can work on any devices. The theme should also be cross-browser compatible so that it can function properly on any major web browsers. Speed Optimized: Nobody wants a slow website. So, your website should also have a good loading speed for the satisfaction of your viewers. A multipurpose WordPress theme with a lightweight framework will definitely help you to achieve better speed for your website. Beautiful Design: In order to boost your website to a higher level of success, the appearance of the website also does have a huge impact. A website with an attractive design is sure to catch the attention of a lot of visitors. A good design will also make them want to explore the different contents of your website. So, a multipurpose WordPress theme with a beautiful design will be quite useful. Easy Customization: This feature is a must for not only a multipurpose WordPress theme but also every type of WordPress theme. One of the reasons WordPress themes are popular is because of how easily they can be customized to fulfill the needs of the of the website owners. So it is mandatory that a multipurpose WordPress theme must be easy to customize. Best Free Multipurpose WordPress Themes For 2018! Zakra is a free multipurpose WordPress theme that can come to use for almost any type of website. It has more than 10 premade demos that can be used for almost any type of website. These demos include websites for business, cafe, drones, dentistry, yoga and many more. Each demo is specifically designed to save a lot of time on customizations and setups. As a result, you can work on them quite easily and quickly. This multipurpose WordPress theme is also developed with a lightweight framework. So, you get very fast loading page speeds with this theme as well. This can be very appealing to your website visitors as it will save a lot of their time as well. If you want a multipurpose WordPress theme that can help you create any type of website effortlessly, Colormag is the theme for you. 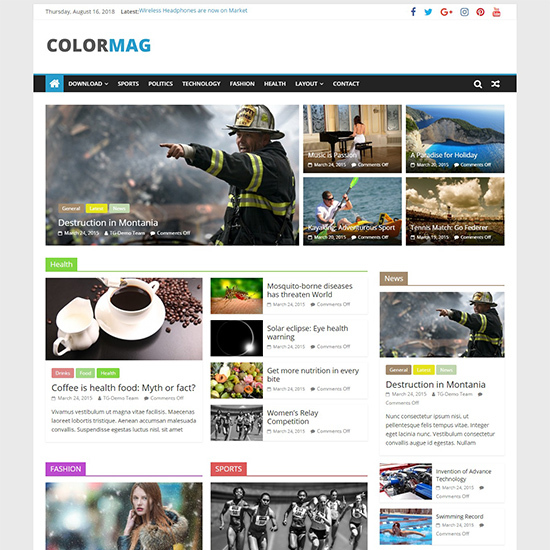 It is the best WordPress magazine style theme but with the help of few changes, you can make any kind of website with it. One of its main features include the color options. You can choose a wide range of color options from primary color options to category color options in this theme. It is also WooCommerce compatible. This can be a great help if you want to create an online in store for your website. There is also 15+ widget areas in this theme where you can also add 6+ custom widgets. You also get a number of featured posts layouts with this theme along with a highlighted post category. 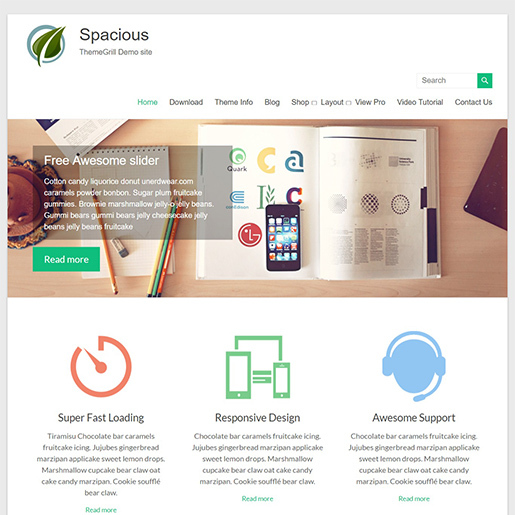 Spacious is one of the most popular business WordPress themes. But, it is designed to help the website owners create any type of website they want as well. So, it is also a multipurpose WordPress theme that has an incredible call to action widget which you can use to guide your users to the most important pages of your website. This theme is also search engine optimized. So, you can gain some more traffic with the help of the title tags that you use in your posts. It is also compatible with major browsers. This can help you to access your website on any major web browsers of your choice without affecting the performance of the website. It also has a very short loading time for theme updates and development with its speed optimization. When you create a website with a multipurpose WordPress theme, you would want a theme with a lot of useful features. For this, OceanWP is one of the most suitable themes for you. It has 12+ creative demos in the free version itself. You can choose anyone you like and install it to make a beautiful website. Furthermore, you can easily customize it as you want with ease. It also has a fully responsive design. So, you can use the website on any handheld devices like mobile phones and tablets. It is also a WooCommerce ready WordPress theme so you won’t have any problem to create eCommerce websites as well. 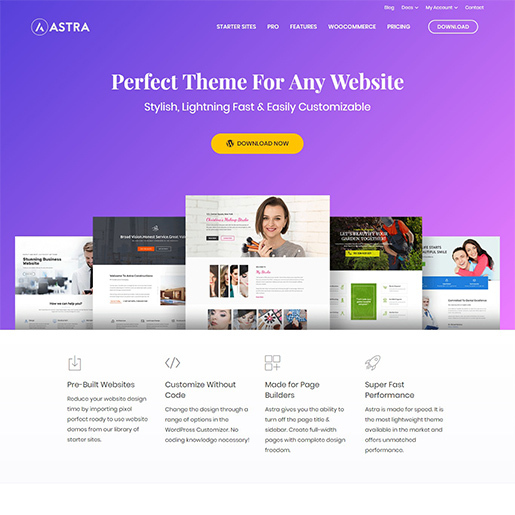 A theme with an easy, simple and fast customization, Astra is one of the best multipurpose WordPress themes to create any type of website. It has a number of in-built websites that will save a lot of your time designing a website from the start. It has a wide variety of demos based on 5 different categories. So, it is almost certain that there will be at least one demo that you can use to meet the requirements of your website. It can also be extensively customized without any code. This theme also has page builder support which can help you to create many advanced and professional pages. It also has a lot of color options that can lead to an advanced typography for your website. 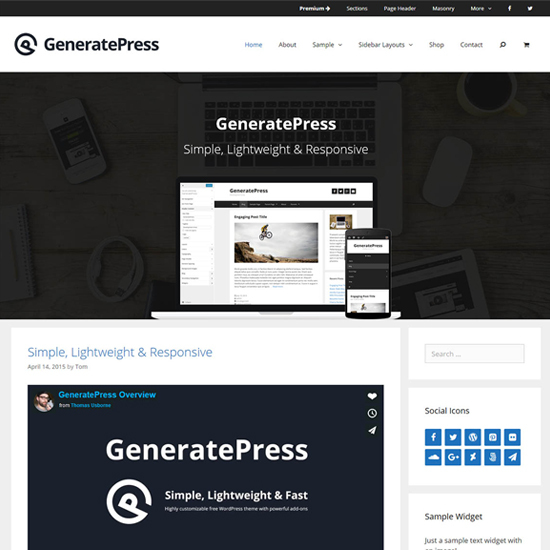 GeneratePress is a multipurpose WordPress theme designed to give you and your users the best performance experience. It is one of the best solutions for all your website development problems. It gives you great security, usability, and speed for your website. The codes used for this theme are also carefully reviewed to meet the latest coding standards. The incredible speed for your website is the result of the lightweight framework of this WordPress theme. This theme is also accessibility-ready. So, everyone can access your website. You also get the option of layout control with this theme. This can help you manage the different layouts for the mobile phones and desktops. 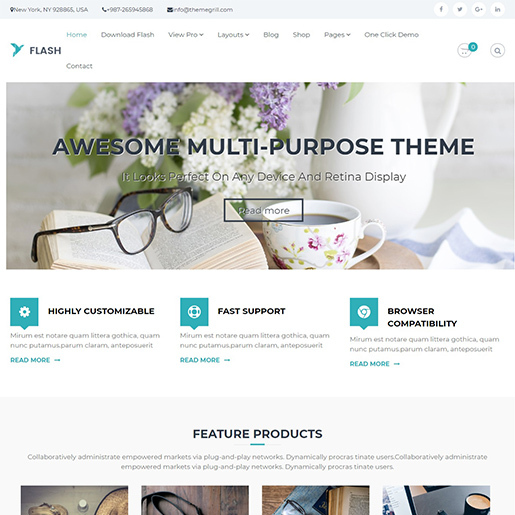 If you want to create multiple websites for different purposes with a single theme, then Flash is the most convenient multiple WordPress themes for you. It is very easy to customize and set up as it is integrated with drag and drop page builder interface. It also features 6+ widget areas where you can add more than 18 custom widgets. You can easily use these widgets using the Flash Toolkit plugin. It includes widgets for service, call to action, testimonial, portfolio and many more. Moreover, you can add custom CSS to change the layout of your website if you have some basic knowledge on coding. It is also social media friendly. It comes with inbuilt social icons where the viewers can share the contents of your website on social media. 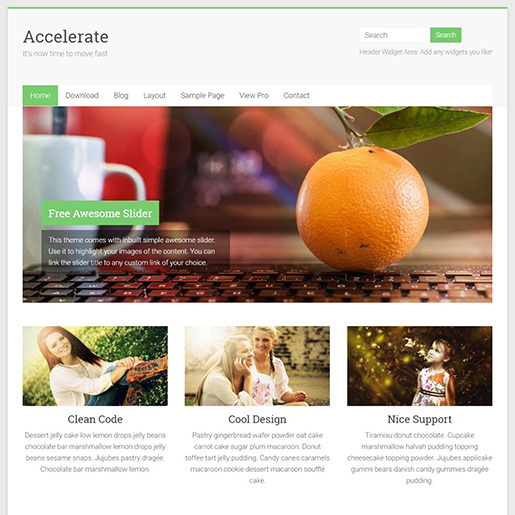 Accelerate is a minimal WordPress multipurpose theme which can be used to create any type of small-scale websites. You can create a well-functioning website for small businesses to personal blogs. It features a lot of customization options for you to create a website. You can use a boxed layout as well as a wide layout for your website. The changes and modifications can also be done effortlessly with the help of a live customizer. You also get an awesome slider to display the images on the website beautifully. It also comes with a number of custom widgets which increases the functionality of the website even more. A website should always look modern after you create it. To help you with it, Vantage can be a great help to you. It is one of the best WordPress multipurpose themes focused to give your website a classic yet modern design. This is very well compatible with SiteOrigin page builder so you can create a lot of advanced pages. It also comes with full width and boxed layouts. You can choose anyone you like to make your website look more elegant. This theme also has a variation of Google Fonts which can also help in making the texts of your website attractive. It also features a number of blog layouts that you can use for your personal blogs as well. 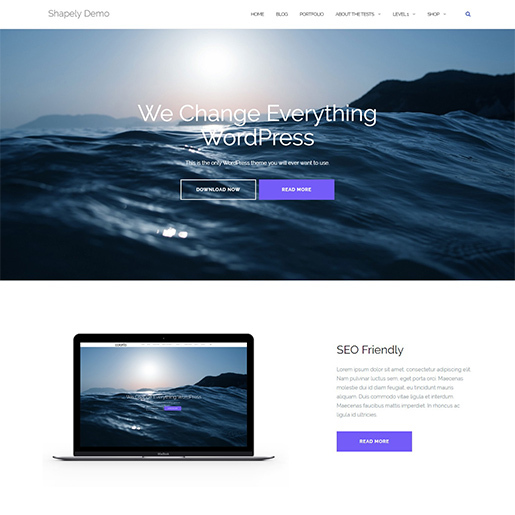 A theme with perfect design and functionalities, Shapely is the one page multipurpose WordPress theme that you will ever need. 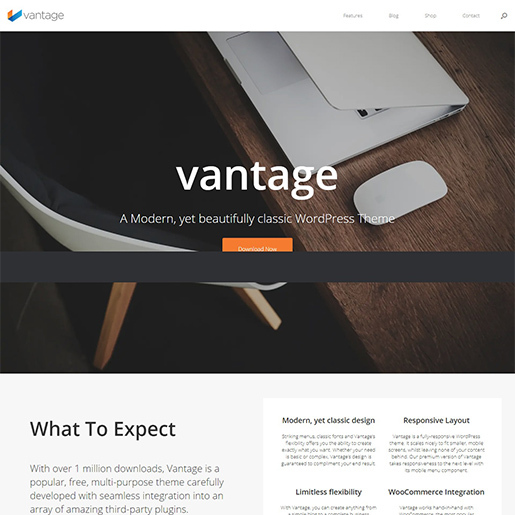 It is also one of the most advanced WordPress themes. It comes with a wide number of homepage widgets. These widgets include testimonials, portfolio, parallax sections, call to actions and many more. It is also compatible with WooCommerce if you want to set up an eCommerce website. This theme also supports plugins like Gravity Forms and Contact Form 7 to create awesome and functional forms for your website. It can also be SEO optimized with the support of the Yoast SEO plugin. 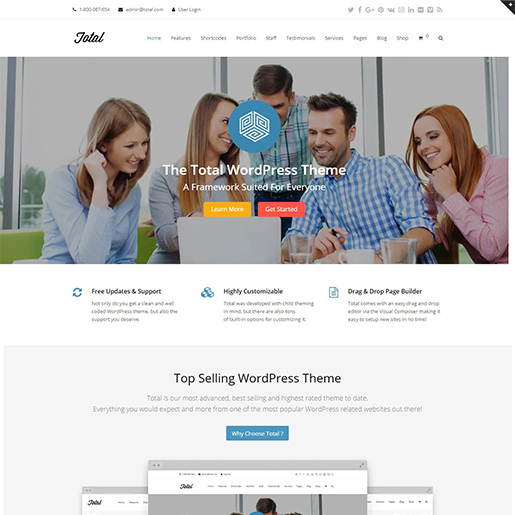 A multipurpose WordPress theme that stands true to its name, Total is the total package you’ll ever need to build any type of website. It has a vast number of features that can fulfill all your needs to create a website. It has a very clean and elegant design with vibrant colors. This can attract a lot of visitors to your website. It also features a sticky menu that can increase the functionality of your website to the users. You can enable as well as disable it as you wish. This theme also has an animated text slider. This beautifully designed text slider can also help to enhance the appearance of the website. Furthermore, it has 10 beautifully crafted homepage sections to make your website even more attractive. Mesmerize can be defined as the act of catching the complete attention of someone. So, you can catch a lot of attention of your viewers with the Mesmerize theme as well. It is a multipurpose WordPress theme which is suitable to create any type of websites. This theme is incredibly flexible. It has a responsive and mobile friendly design. So, you can use this website on any type of devices like desktops, laptops, mobile phones or tablets without any problem. The variation of the device won’t affect the performance and appearance of the device. It also features 100+ predesigned block sections that can easily boost the design powers for your website. 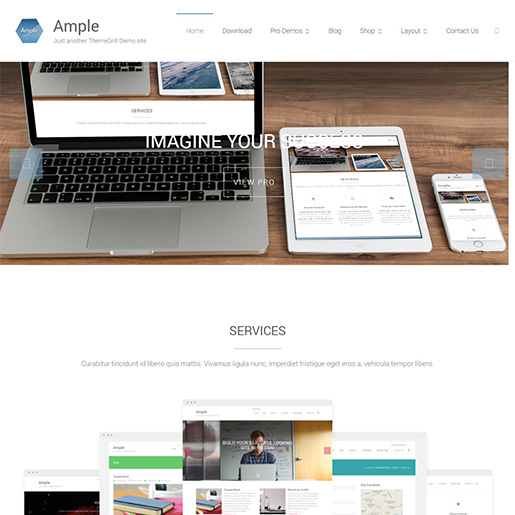 Ample is a multipurpose WordPress theme developed to help you create any type of a website in no time. It has a lot of built-in options to help you with how you want your website to look. It is also packed with a lot of features that can be very useful for you to create a website. This theme has 4 custom widgets specially created to make professional websites. It also has a lot of customizable options like primary color options, awesome sliders, live customizer and many more. This theme is also translation ready. So, your visitors will not have any language barriers when using your website. This is always a nice feature to have on your website for better user experience as well. If you want a multipurpose WordPress website with page builder support, then Bulk is the perfect solution for you. It is made with Elementor page builder support. So, you can create many advanced and professional pages for your website. To help you with this, it also has a drag and drop interface. This theme also has a responsive design. You can use this website on any handheld devices without any delay in the performance. It also helps you to maintain the beautiful layout of your website. This theme is also WooCommerce compatible. So, you can also build an online store in your website with this theme if it’s necessary. 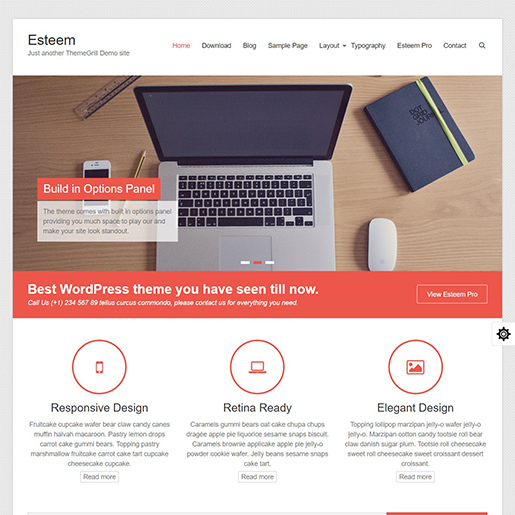 A theme which you can just admire a lot, Esteem is a multipurpose WordPress theme that can help you to create any website. 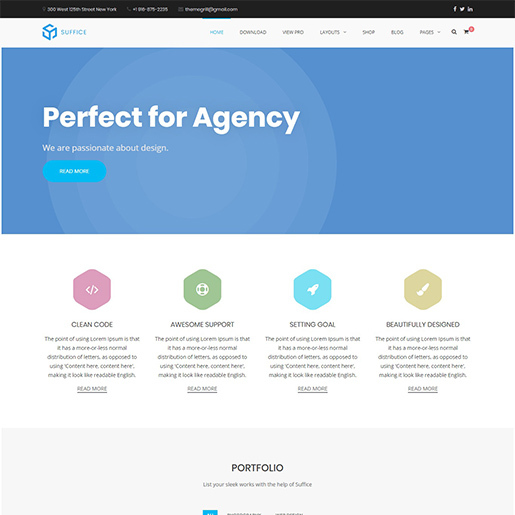 It has a clean, simple, and flat design that can go with every type of website. This theme also comes with highly customizable options. It has 4 custom widgets to start with. 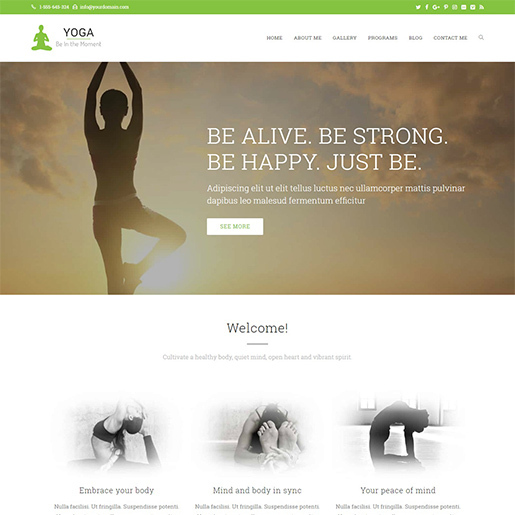 You can also add a beautiful header image to your website with the help of this theme. It also gives you two different layouts, i.e., boxed and wide layouts. Select any one of the layouts to suit your needs. You can also add custom CSS to increase the functionality of your website with this theme. This theme is also search engine optimized. It will help you to rank your website higher from the competition and result in better success. 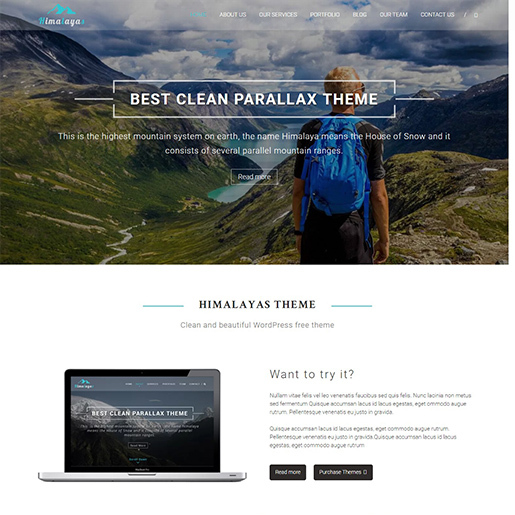 A multipurpose WordPress theme named after the highest mountain ranges, Himalayas is sure to take your website high to the success. It has a one-page layout with a responsive design, which can be easily accessed in mobile phones and tablets. 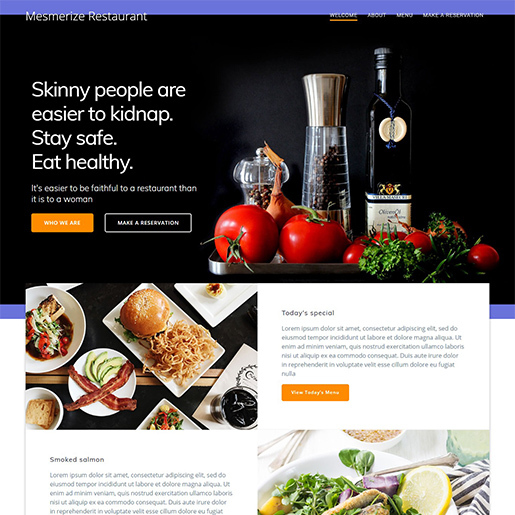 This theme can be made for any type of website. It is suitable for business, photography, travel, blog, and many more websites. It has a very beautiful one-page parallax design with an awesome slider and primary color options. You can easily modify it to make an even better-designed website. This theme also has a sticky header menu which is visible on the header even if you scroll up or down the website. 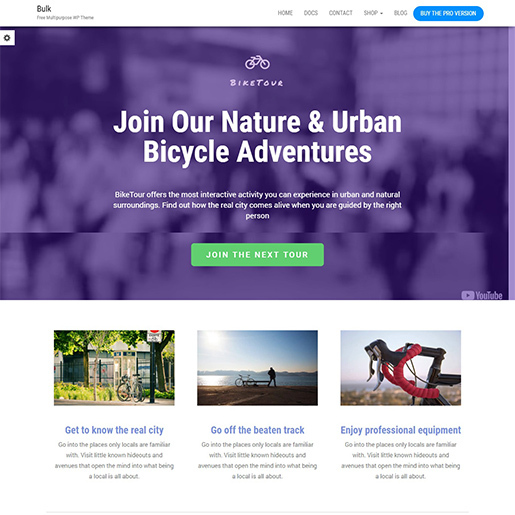 Suffice is a multipurpose WordPress theme that is available with demos for business, construction, food, gym, and many more websites. It also has a very beautiful design with a lot of features. You can even increase the functionality of the theme by installing the Suffice Toolkit plugin. This will enable to use more than 16 custom Suffice widgets to create your website. It also has 7 widget areas where you can add these widgets. This theme is also integrated with page builder support through which you can create a wide number of useful pages for your website. It is also search engine optimized and follows the best SEO practices. This will help you deliver your content to the search engines and gain more traffic. Using a highly customizable theme is always helpful when you create a website. 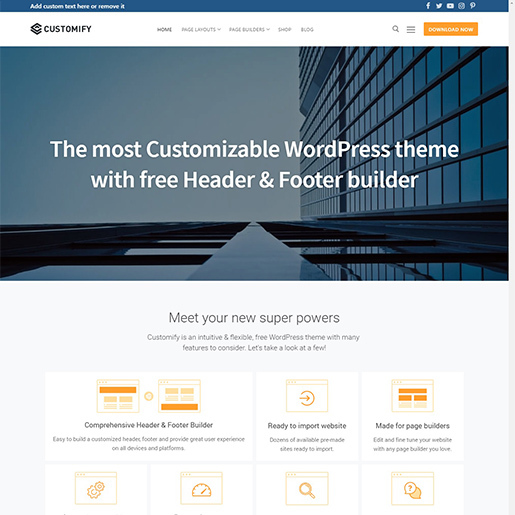 If you want to use one, then Customify is the multipurpose WordPress theme that you should have a look at. Its main feature is the ability to customize the theme as it is given out in the theme name itself. 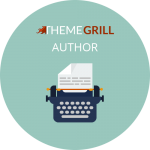 This theme has the option of comprehensive header and footer builder. You can easily build header and footer for your website to increase the user experience for your website visitors. It also has many pre-made sites to import. You can select anyone and modify your website based on these demos. It also has a lightweight framework that provides you with a very fast performance for your website. 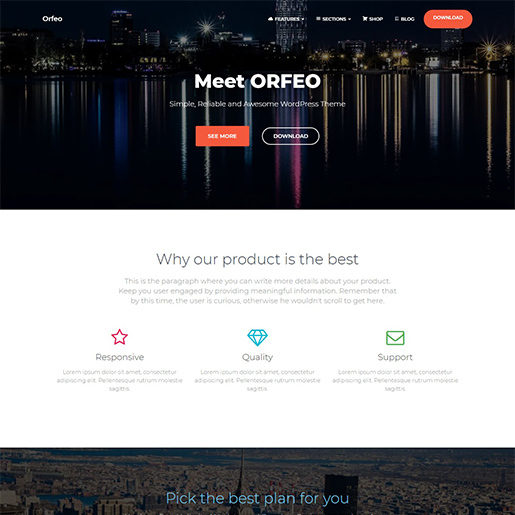 If you want a multipurpose WordPress theme capable to create any type of website in no time, you can easily do so by Orfeo. It is a theme developed to help you create excellent responsive websites. So, the websites created with this theme can work efficiently on any type of devices of any screen sizes. It doesn’t affect the performance or the appearance of the website in any way. It is also fully compatible with WooCommerce. So, you can create an eCommerce website as well with the help of this theme. You can also increase the customization options using this theme with the help of a live customizer. This enables you to view your changes in real time simultaneously. When you create a website, you need to make sure that it looks unique and has a lot of unique features from other websites. 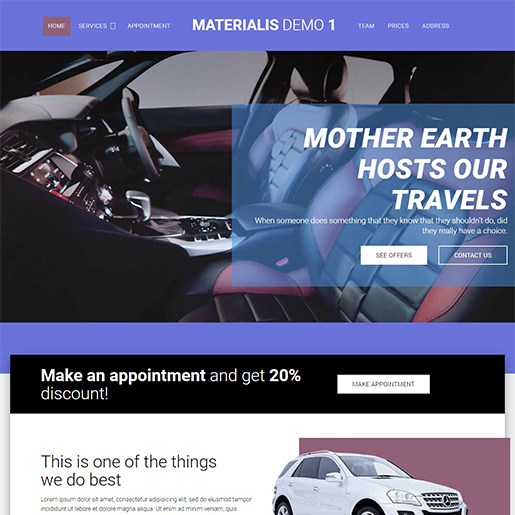 Materialis can help you a lot with creating a unique website. It is a multipurpose WordPress theme developed for wide ranges of customizations to create unique websites. This theme is also available with more than 100 predesigned sections. You can use these sections to build a lot of beautiful pages for your website in no time. Some of these sections contain team, testimonials, call to actions, portfolios, contact forms, etc. This theme also supports the live content editor from the customizer. You can also modify the layout of your website that suits the best accordingly. 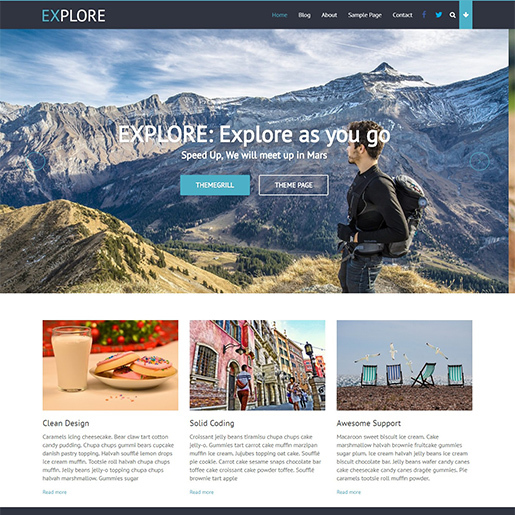 Explore is a beautiful, clean and neat multipurpose WordPress theme developed to help you explore new ways to create any type of websites. It is a feature-rich theme with which you can make great websites. You can make a lot of modifications to this theme to create your website. You can select between a light skin and a dark skin to set the visual tone of your website. The options for awesome sliders and sticky menu are also available for this theme. You can also set your website into boxed or wide layouts along with a lot of primary color options. Furthermore, there are 10+ widget areas in this theme that can help you with increasing the functionality of the website. ← 20 Amazingly Elegant Wedding WordPress Themes For Every Kind Of Matrimonial Sites!